You might be wondering what these two pictures have in common. Ok, maybe, especially if you ever lost a tooth or known someone who's lost a tooth. We are all very familiar with the ol' dental floss tied to your tooth and a doorknob trick, but this time was not that well planned. See, Tanner has this really bad habit of coming in my room while I'm getting dressed and this morning was no different. So I kindly asked him to leave my room and I'd be out in a minute. This he did and while waiting for me, decided to have his mouth on the door handle. I'm not real sure where that brilliant idea came from, but whatever. 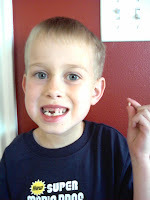 So, when I was done, I turned the handle to open my door and when I came out, Tanner jumped up from picking his tooth up off the floor and stated, "My tooth came out!" He then told me how he had his mouth on the handle so when I turned it, it was just enough to knock his tooth out. Mind you, we've had to tell him to keep wiggling it because he won't let Tyson even get near his mouth! For that reason see here. In any event, we will have another visit from the tooth fairy tonight. Oh how exciting!! Just an update to our true time of the half marathon. Funny thing is Tyson said he didn't push himself because he thought his time from last year was 1:46:something, well, looking back at last years time, AFTER the race this year, he actually ran last year in 1:40:01. Needless to say he wasn't too happy that he was just over a minute over his time from last year. Next year, he'll make sure of his time so he can beat it. We had a conversation with the kids about a vacation this year. Of course, without hesitation, they all want to go to Disneyland. So Tyson told them there were other places to go. Then asked if there were any other places they'd like to vacation to. Sure, DisneyWORLD. Ok, so they didn't exactly get the point of that conversation. We're still working on a place to go. Our half marathon is now behind us. All in all, it wasn't too bad. My morning started at 4:30am! I had to get some things done before we left our neighbor with the kids. I owe my friend Deb Sadler big time! She got to our house at 5:30am and stayed with the kids while we left for our race. I told her just to have Tanner and Tyler get dressed and the two younger boys were fine in their pj's. When I met up with them after the we finished, all four kids were dressed and ready for the day. Those who wanted to eat, had eaten and she was a pro! You'd think she had many kids of her own. I'm just glad she offered to help us out. My mom was supposed to have the kids, but had some last minute things that were more important, come up. Anyway, we heard the gun shot for the start of the race, but no one was in a big hurry to go, as there were 10,000 people that had to get across the start line. They have foot chips now that start your time when you cross the start line and finish when you obviously cross the finish line. I kept a steady pace of 6.5 miles an hour. My sister Carli was close behind and Tyson schooled us all and didn't even wait for us to start the race. I didn't see him until the race was over. Tyson finished in 1:41 and I finished 2:about 6minutes. I'm not sure on my real time as I they haven't posted the official results yet and I forgot to start my watch as I crossed the start line. Tyson started his on time so he's sure of his time. The kids also had their own marathon they were signed up for. Only problem was we were on the other side of the Gateway when they announced two minutes to the kids marathon. WHAT?!? So we booked it over to the start line for them, just in time to see the last of the kids come through the finish line. We were upset for a minute, but then I took the kids by the hand and told them we didn't need someone to tell us when to run, so we just took off. Tyson and I were very impressed with both kids. We didn't have to tell either one of them to keep going, they both kept up with my crippled pace and they crossed the finish line. They were even recognized by the announcer as we crossed and got their own medal as well. And now we sit around the rest of the day because no one can walk anymore. I don't know how people do full marathons! Tyson's trying to talk me into one...we'll see. By the way, the first place full marathoner, ran the 26.2 miles in 2:16!!! Its been a few weeks, and a lot has gone on and I realize I am slow to update the blog lately. Not that anyone even cares, but it also somewhat serves as my record keeping. That's pretty sad. I wish I were better at documenting things, but I'm not. In our household, the kids are quickly learning that March means March Madness, as in NCAA March Madness. This year, Tyson had everyone choose the teams they thought would win each round. After we had all chosen our picks, we put a wager on it. The person who won in the end, got to choose what we all had for dinner. Oddly enough, pretty much after the first round, it was between Jake and myself for the rest of the tournament. Jake chose pizza and root beer, I decided on Chinese food. No one was real excited about it. I won. In any event, the night of the final game, Tyson brought home chicken wings and meatballs from work, (I can't think of anything worse to eat!) and we had a picnic downstairs while we watched the slaughter. About five minutes into the game, my team was already 20 points ahead, and it pretty much stayed that way for the rest of the game. Oh well. This is something Tyson is wanting to really get into every year. It was fun. Jefferson went through this stage for a while where if you took out your camera, he would just stare at you and nothing you did could get a smile out of him. Well, I think he's discovered that you are supposed to smile when you see this funny thing called a camera and now puts on the biggest cheese grin you'll ever see. Its so cute! He's now crawling like a mad man. Poor kid even fell down the stairs today. Yes, all 12 of them. He got some good little marks on his forehead. It was so cute though, because Jake was bringing all sorts of toys to try and make him happy again. He recovered quick enough, but that isn't to say I wasn't rattled. The kids have been off track for the last two and a half weeks. We are actually in our third week and have managed fairly well. I would have to say it makes a HUGE difference when the weather is warmer and you can send them out to play every so often. We have also had someone build our garden box, finally! Every year we get our tax return, we talk about it, but don't do anything with it. Well, this year, I decided that since the kids are going to a traditional schedule and will have the full three months of summer, we are going to grow a garden and pretty up our backyard so my kids don't have to go play in the front yard. Hopefully it works! I'll get pictures once the weather is nice again and I actually have things planted.